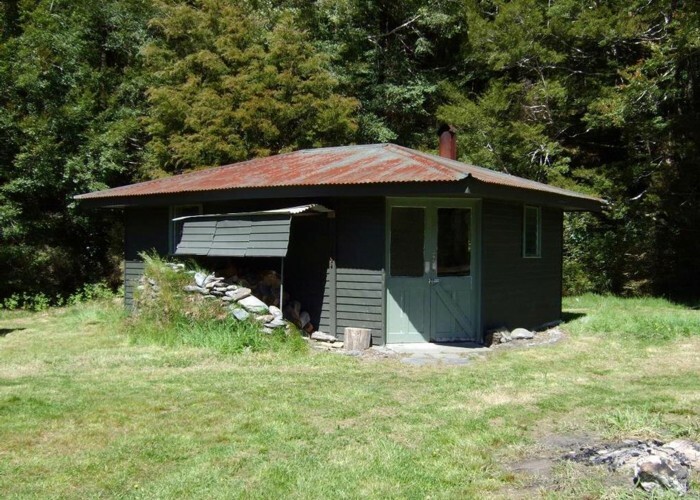 This hut is located on Frazers Flat on the TR of Pell Stream about 400m above the confluence with the Alfred River. There is 4x4 access to this hut up the TL of the Alfred River from the Marble Hill car park once the Maruia River has been forded from the Calf Paddock. This is the same route as taken to the start of the Pell Stream track. It is on the opposite side of the Alfred River to the popular route to Lake Daniells. You can walk the Lake Daniells track to get most of the way to this hut then cut across the Alfred River to the 4x4 track. Ford or use the log bridge which there is a track to. Blackadder's hut was used during their gold mining period in the Pell and would date from about 1980. It is unlocked and available for public use. Various DOC signage is inside plus information booklets & photos of the Blackadder mining operations. The hut has two rooms, concrete floors & a big free standing fire box. No bunks though! Blackadder's hut • By glennj. Licence: C.
Blackadder's hut can be walked to in a bit under an hour from either Marble Hill or the M-N Lake Daniells hut. Also see notes in description. Added 13 November 2012 by glennjglennj. 3 revisions, most recently 3 April 2017 by MatthewMatthew.